Tamra Seal at Pro Arts Gallery. Sarah Burke Installation view of The California Surface. For many Americans, California is a fantasy filled with sun-soaked beaches and laidback living. And there’s a certain aesthetic that accompanies that: Surfer culture, Hollywood luxury, and bright, shiny surfaces like the kind you might find covering a “woodie” station wagon cruising down the Pacific Coast Highway. In her current solo show at Pro Arts (150 Frank H. Ogawa Plaza, Oakland), The California Surface, local artist Tamra Seal explores the ways in which California is idealized through sculptural riffs on the superficial aesthetic for which it’s known. 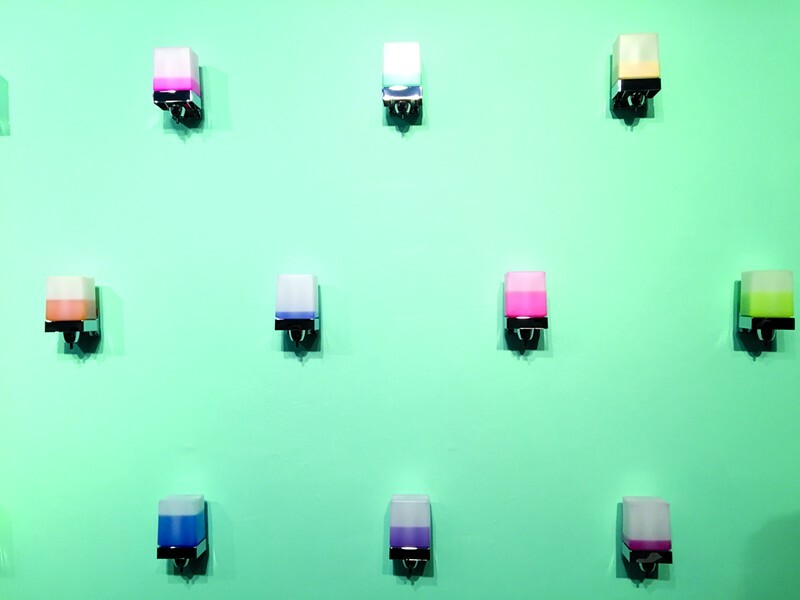 On one sea-foam-colored wall, simple soap dispensers filled with a collection of eye-catching colors are hung in rows, evoking an overly sweet, theme park artificiality. In front of it, a clean, white tire is adorned with reflective crystals, spiking out of the rubber. With these pieces, Seal mixes romanticized notions of the rugged outdoors with California New Age mysticism and the sterility of contrived, commercial spaces to form a hyperbolic, high-fructose corn syrup version of the mythological California aesthetic.